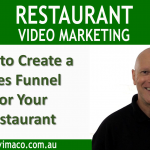 In this video, we look at two different strategies to get more customers to your restaurant. You may have already used Groupon, which drives traffic to your restaurant using your special offer. Groupon users pay upfront for the special deal. Groupon takes their cut and you get the rest, regardless if the coupon is redeemed or not. This strategy is obviously a loss leader, so you need to upsell to these new customers and hope that they come back to get a positive ROI. You have to understand that the users of Groupon are Groupon’s customers, not yours. They are bargain hunters and they are indoctrinated by Groupon’s messages to “never to pay the full price.” That might be good for Groupon – but not necessarily good for your business. The Restaurant Sales Funnel Recipe, also uses a special coupon offer to drive traffic, but comes at the opposite end of the “Customer Awareness Journey”. By that I mean, Groupon and other similar marketing tactics, are targeting users that are ready to ‘buy’. They know they have a problem, they know the solution (going to a restaurant), and they just need to the right offer. This is at the end of the Customer Awareness Journey, where all your competitors are battling for the three percent of the market. This is known as the marketing in the “Red Ocean”. Advertising is fierce and expensive. The Restaurant Sales Funnel uses Facebook video ads that targets your ideal customers at the start of the Customer Awareness Journey – before they are aware of a problem. This the Blue Ocean where 50% of your potential customers are and where there is little competition. Viewers are able to optin for a Godfather Offer (one that they cannot refuse), so that when there is a problem (no food in the fridge, special anniversary etc.) comes along, they already have the solution. Another significant difference between Groupon and the Restaurant Sales Funnel is the marketing tactic. Groupon users Extrinsic Value only. That is the special offer, whereas the video users both Extrinsic and Intrinsic value by creating an emotional desire for the restaurant. This is reinforced with real testimonial of diners in the restaurant. This is why the video so effective. I believe the most critical difference between the two strategies, is that Groupon only drives traffic to the door, whereas the Restaurant Sales Funnel follows through to bring back the customer at least three visits. Statistics show that if your customers has three positive experiences at your restaurant, there is a 70 percent likelihood that they will become regular customers. The good news is that the Restaurant Sales Funnel is totally automated so that you can focus on serving your customers.